Mitsubishi Motors' Eli Kipper celebrated the arrival of the 2018 Outlander PHEV. 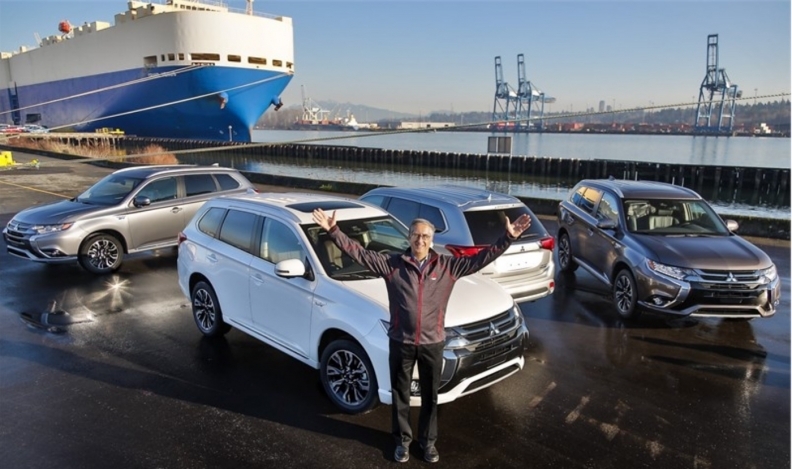 The first shipment of the 2018 Mitsubishi Outlander PHEVs for Canadian sale have arrived at the Port of Vancouver. The all-new model will arrive in British Columbia showrooms first before moving eastward in the coming weeks. The 2018 Mitsubishi Outlander PHEV is the first mainstream plug-in hybrid electric vehicle in the midsize crossover segment in Canada. The vehicle starts at $44,448, shipping included. The powertrain, which comes only in all-wheel drive, has six modes of regenerative braking that are controlled via shifters on the steering wheel, and three drive modes: charge, save and EV priority. It is also the only PHEV with DC fast-charging capability providing an 80 per cent charge in less than 30 minutes. The base model SE comes with standard blind spot warning and rear cross-traffic alert, Android Auto and Apple CarPlay, satellite radio, 18-inch alloy wheels, rearview camera, heated side view mirrors, heated front seats and more. The SE Touring Package will cost $47,448, destination included, and adds a power sunroof, leather seating, heated steering wheel, LED headlamps and LED fog lamps. And at the top of the line sits GT S-AWC, a premium offering at $51,448, including shipping, and comes with forward collision mitigation with pedestrian detection, adaptive cruise control, lane departure warning, a multi-view camera system, power liftgate, a 1,500-watt power inverter and more.